Twante, a charming little town across the river from Yangon, thrives as one of the few pottery making centers in the country. 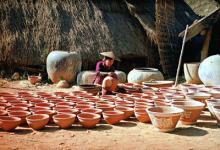 In much of rural Myanmar, ceramic pots still leads as dominates in Burmese households and it is at Twante where one can observe the industry in action all year round. You can attend various workshops offered by the locals and observe the traditional process of pottery making from the sieving of clay to the drying of the finished products.